Another winter upon us, and another free Friday with mountains on my mind, but where to go? Logistics are always the most difficult to pin down, with frantic searching and double-checking of train and bus times. 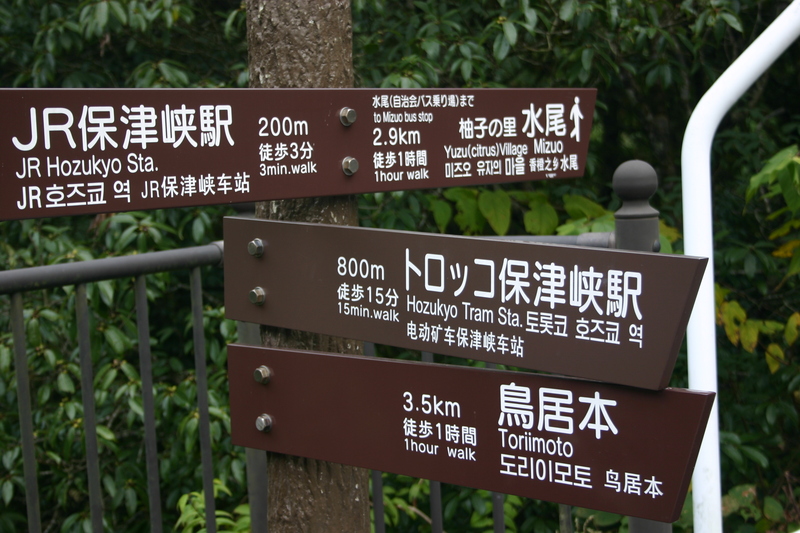 I’d finally narrowed it down to 2 peaks in northern Kyoto: Mt. 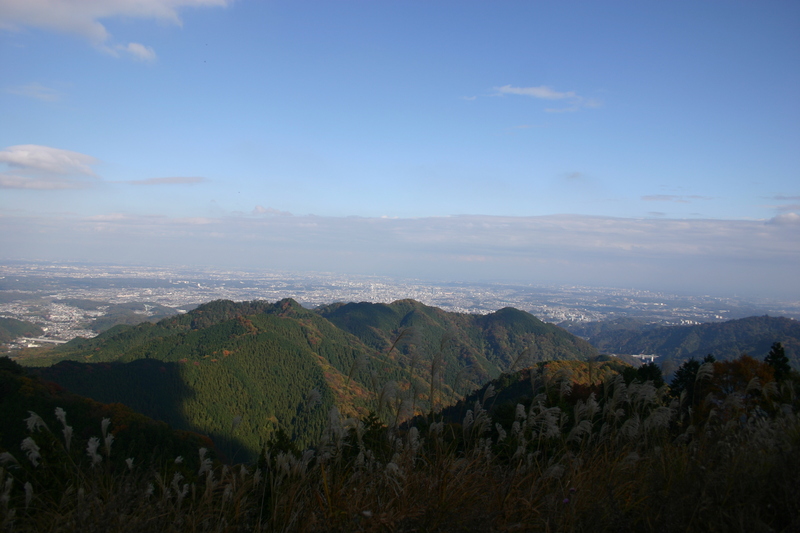 Minago, the tallest peak in the prefecture, or Mt. Kumotori, a tamer hill one valley west. Both involved an early departure, but the lure of the waters of Kurama hot spring resulted in a last-minute victory for the cloud taker. The Keihan train sped through Osaka and Kyoto prefectures before dumping me off at Demachiyanagi station a little before 10am. I found the bus stop and hurriedly grabbed a sandwich from a nearby vendor. The bus departed preciously at 10am, and kept making repeated announcements about norikae (Japanese for transfer). I wasn’t sure what the driver was on about, as my bus was supposedly a direct route to my destination. A few stops further on, a retired guy in his early 60s boarded the bus with a pair of short skis! 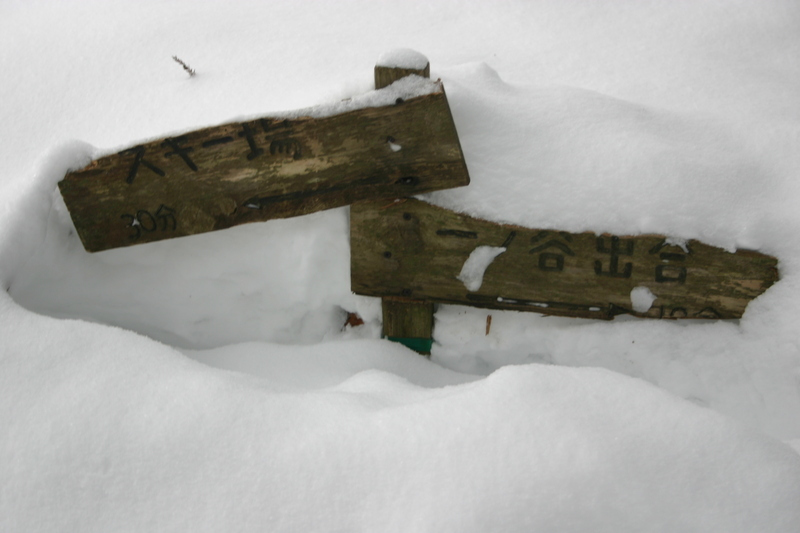 With absolutely no snow to show for in Kyoto city, I struggled to comprehend his intended destination. 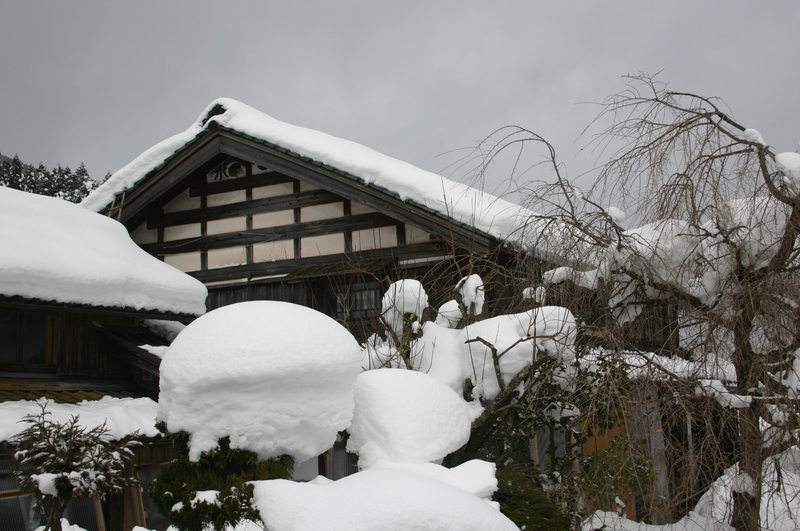 Nagano, perhaps? Just short of Kurama, the bus pulled into a parking lot and everyone was ordered off. We were whisked into an adjacent bus with chains on the tires. “So that’s why we needed to change buses”, I exclaimed, congratulating myself on not forgetting the crampons for this mission. As the bus followed the contours of the train tracks, the first snows began to appear. What started out as a gentle dusting quickly grew in stature as the bus gained altitude on the desolate forest road. 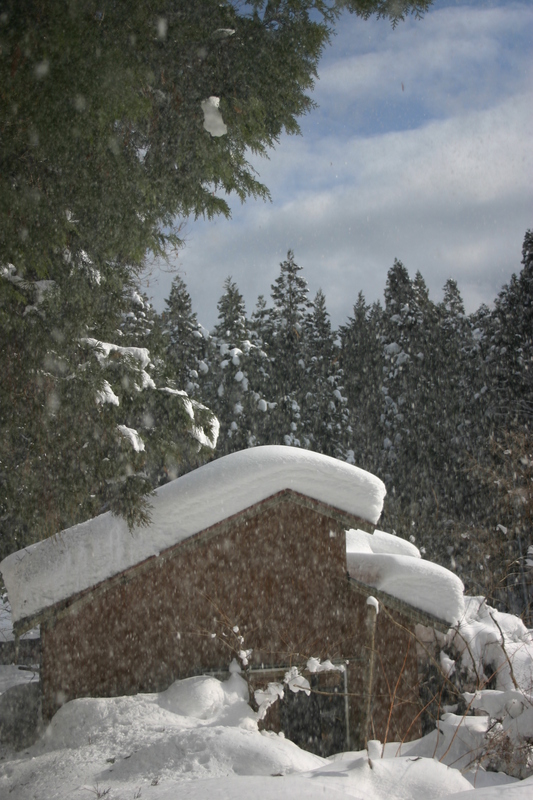 We had now entered what is commonly known as yukiguni (snow country), a term usually reserved for the big snows of Nagano and Niigata Prefecture, but mother nature had decided to spring on the Kansai region this year. 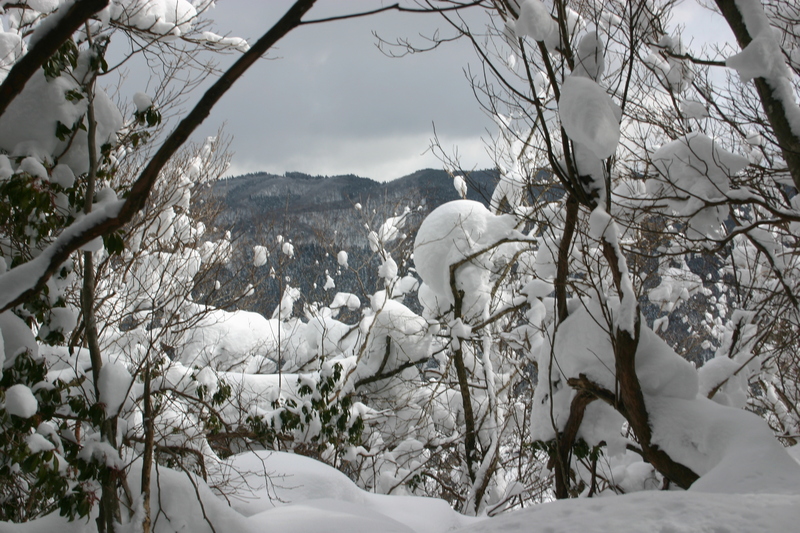 The skier got off at the mountain pass, while I stayed on for another 10 minutes to the scenic village of Hanase. The butterflies in my stomach suppressed my appetite, as I forewent lunch in favor of trying to find the trailhead. No signposts in sight. Just a foot of fresh powder all around and not a soul to witness it. 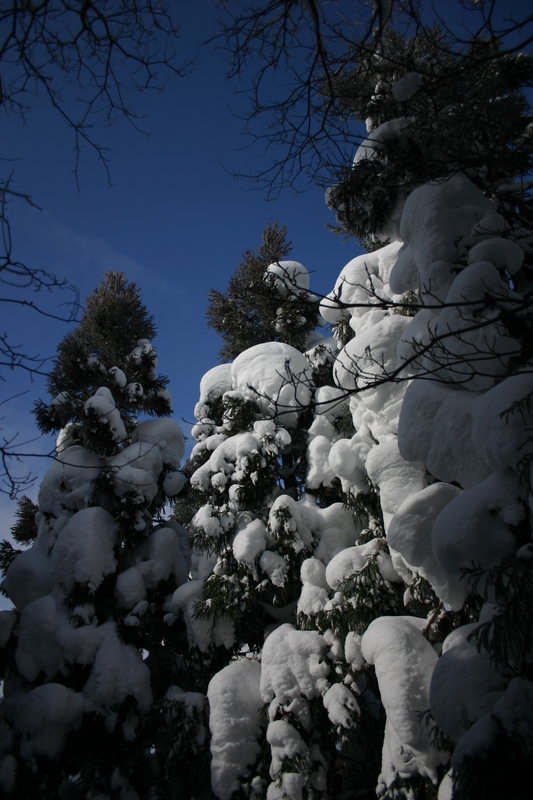 I was clearly in over my head, and knew crampons would be totally useless with this much soft snow. Still, I stubbornly strapped them on and followed a faint set of foot prints up the road. I soon reached an abandoned restaurant belonging to the adjacent lift of a deserted ski run. The recent lack of snowfalls over the last decade had surely bankrupt the place, but I was happy for a dry shelter to sit down and ponder my next move. I tightened up my snow pants snugly around my boots, reached for a waterproof layer to ward off an approaching snow squall and reluctantly entered the forest. The tracks I was following were probably laid over a week ago, but the indentations were still clear enough to discern in the white canvas of the forest floor. 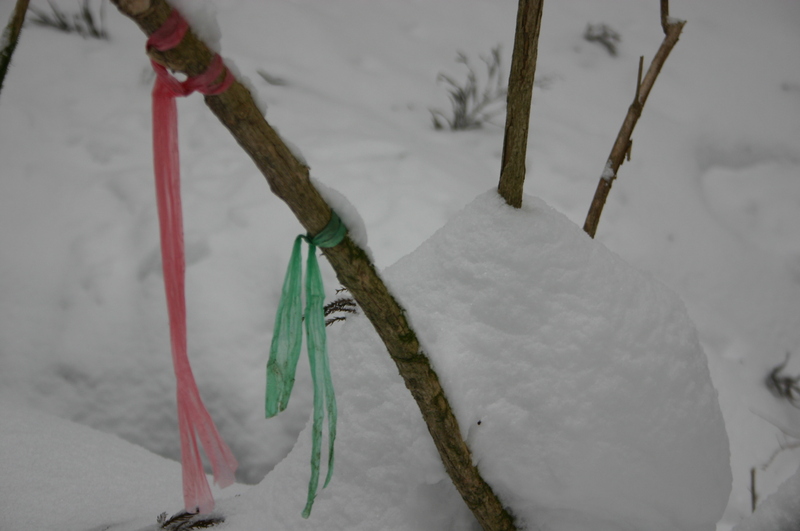 That, and the generous amounts of tape affixed to the cedar trees, made navigation surprisingly easy. Navigation, however, wasn’t the problem at hand. Depth was. After 20 minutes of following a docile stream, I’d found my first signpost of the day, and continued following the scuffs in the snow on a rather tricky traverse with long drops on the right. One slip here and I’d surely tumble to the bottom of the valley. Finally, after a sweat-filled slog, I reached the mountain pass, where the tracks completely stopped. My navigator decided that this was far enough, and I was left with a couple of options. Deciding it was too early to retreat, I continued following the summer trail through a nasty gully filled with thigh-deep powder. After 200 meters I abandoned this idea and re-climbed back to the junction. Rather than getting trapped in a deep ravine, I opted to stay on the ridge. Despite being marked with tape in the trees, this route was not on the maps. Perhaps it is a winter approach only? Time check: 1pm. The only convenient bus back to town left at 3pm, so I set a 1:45pm turnaround time, no matter how far I’d get. 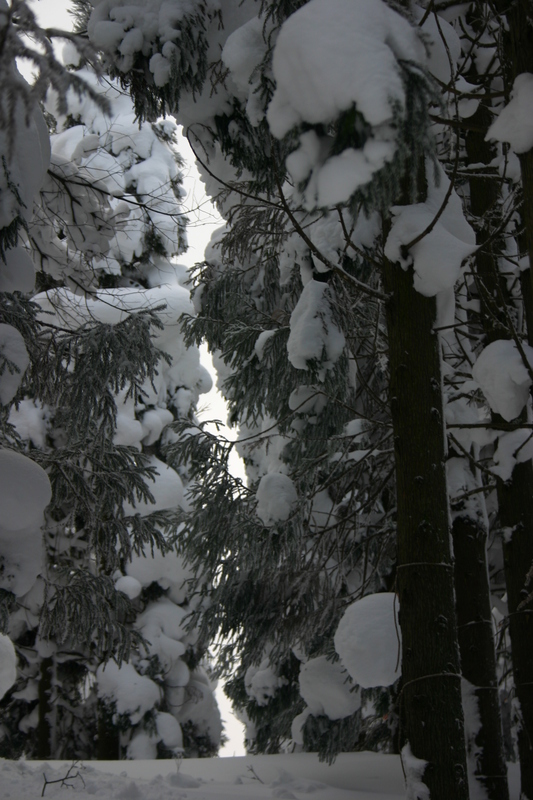 With each advancing step I sunk below my knees, as the snow searched for any available gaps to invade my trousers. 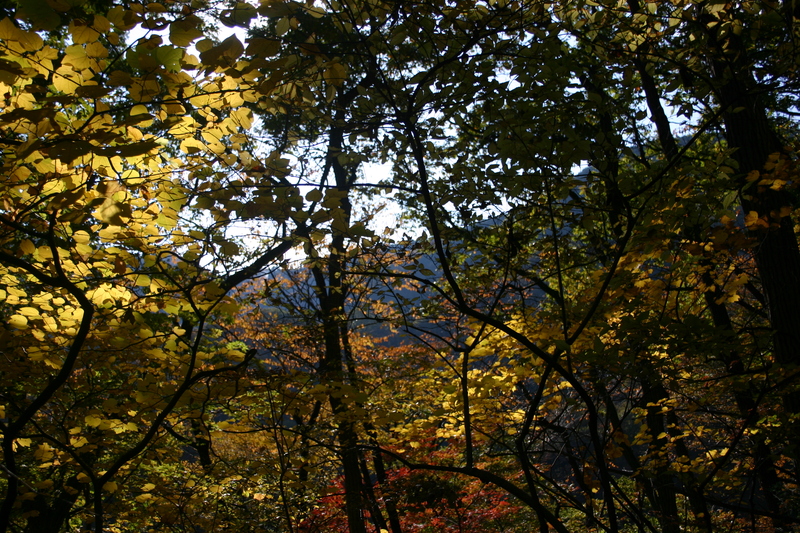 Hiking through the dense undergrowth was a breeze compared to reaching an open area exposed to the sky. Here, the snow drifts were waist deep and no match for an under-equipped day hiker. What on earth were my snowshoes doing at home? I was really starting to regret that foolish decision. 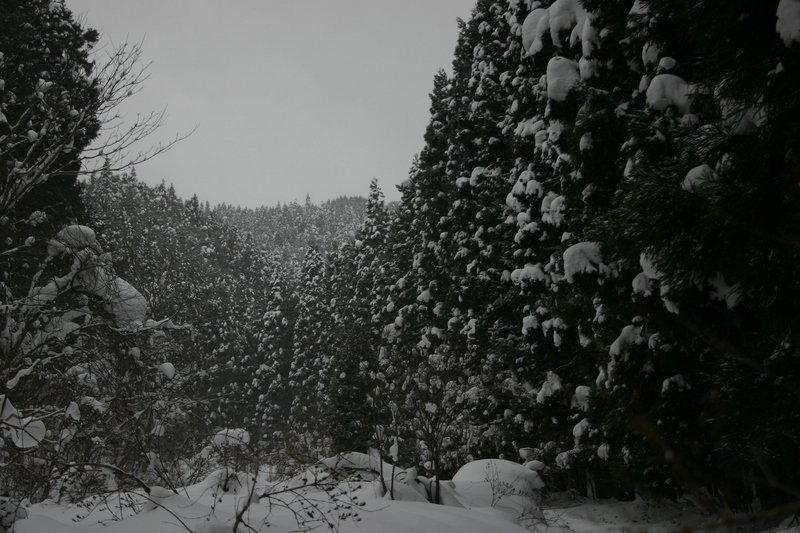 Clearly I’d underestimated the power of the Kitayama mountains. Somehow I gathered up enough courage to keep pushing on, thinking the summit must lie just over the next rise. The best part of the entire slog was the scenery. The views would occasionally open up and the sun even started to come out. 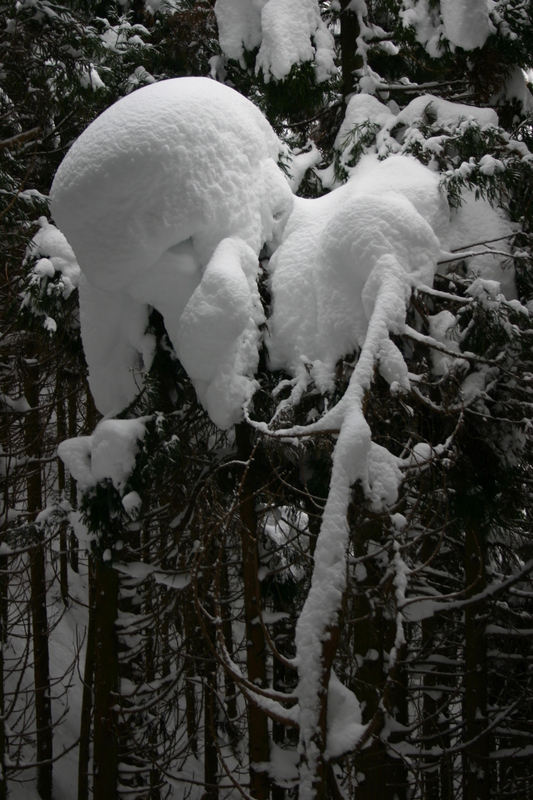 The snow in the trees was absolutely magical: the heavy weight would occasionally be too much for the brittle limbs, as large clusters of snow bombs came crashing down every few minutes. A direct hit could very likely knock me out, so I refrained from any unnecessary lingering. Finally, I reached the crest of a rather long climb and was met with a steep drop, followed by a series of larger climbs rising in the distance. Time check: 1:45pm. I needed at least another hour to reach the summit, but some things can wait. Dejected I was not, as the slow retreat back to the bus stop began. It took about 45 minutes to make it back to the mountain pass, where I picked up the pace down through the cedar forest. I made it back to the abandoned ski resort at 2:45 and stopped to drink some water. I was really starting to get hungry at this point and ungracefully tore open the packaging of my sandwich, stuffing a handful between my teeth. I chewed and walked as the sun shone in full force. The hum of an aircraft caught my attention, and a helicopter swooshed overhead as if to check on my progress. Could the local have actually called in a rescue copter? Highly unlikely, I thought, but you never know. After all, I never saw the copter again after that. Back at the bus stop, I changed out of my wet clothes and paced back and forth, waiting for the bus. It turns out it was 10 minutes late, but as I boarded the bus, I found the reason for the tardiness. I got on the bus and was immediately ushered to an empty seat by two young gentlemen standing near the door. “What the…”, I started to say, until I noticed another guy holding a large camera. By now, the usher was squatting next to me, and I noticed the NHK press badge. “Oh…”. In a hushed voice, I asked the crew what they were filming. 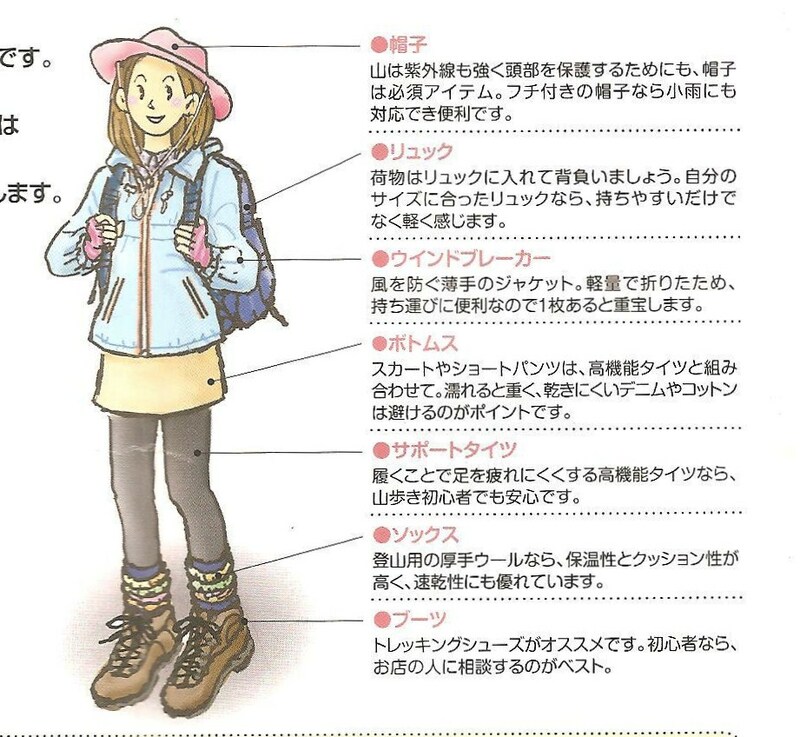 “Tabi bangumi” (a travel program). Sure enough, 3 seats in front of me sat one of the most beautiful Japanese women I’d ever laid eyes on, staring out the window as if in a forced reverie. The cameraman filmed the entire sequence. A short distance later, at the next bus stop in fact, the entire crew and actress said a quick thank you and alighted. Bizarre. I got off at Kurama onsen and immediately headed to the outdoor bath, soaking my battered body and finally regaining feeling in my toes. A bath after a hike is always nice, but the satisfaction is tenfold when losing a fierce battle to mother nature. Mt. Kumotori sure put up a much bigger fight than its Kanto counterpart, and revenge will be mine. I just need to bring the snowshoes next time. At the foot of Mt. 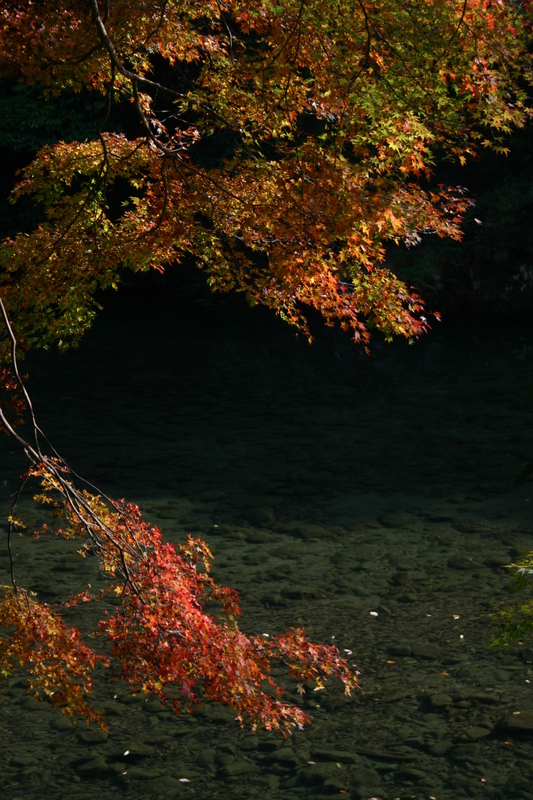 Atago in northern Kyoto city lies a tranquil river by the name of Kiyotaki. 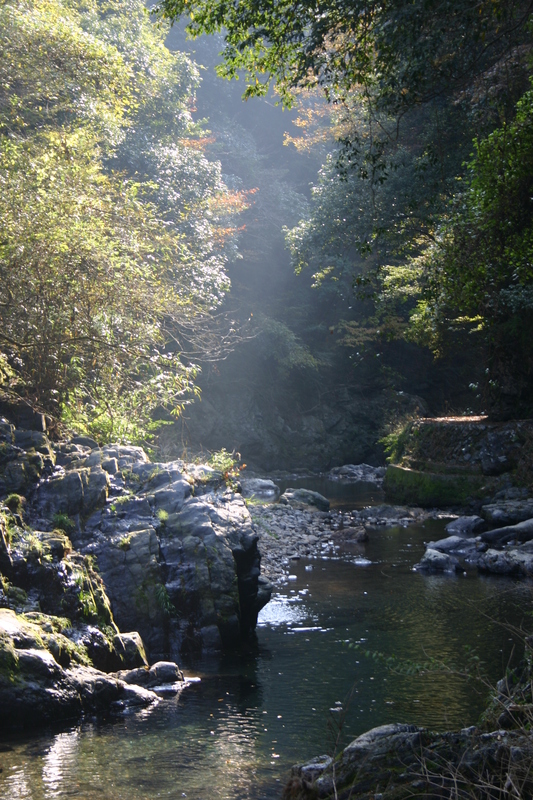 I’d strolled its secluded banks half a dozen times over the last decade, but had never explored the upper fork between the village of Kiyotaki and Takao. I seized a break in the fickle autumn weather, catching an early train to Kyoto under gradually clearing skies. The rain had just let up by the time I slipped through the unmanned gates of Hozukyo station, throwing on an extra layer to ward off the eerie autumn chill. 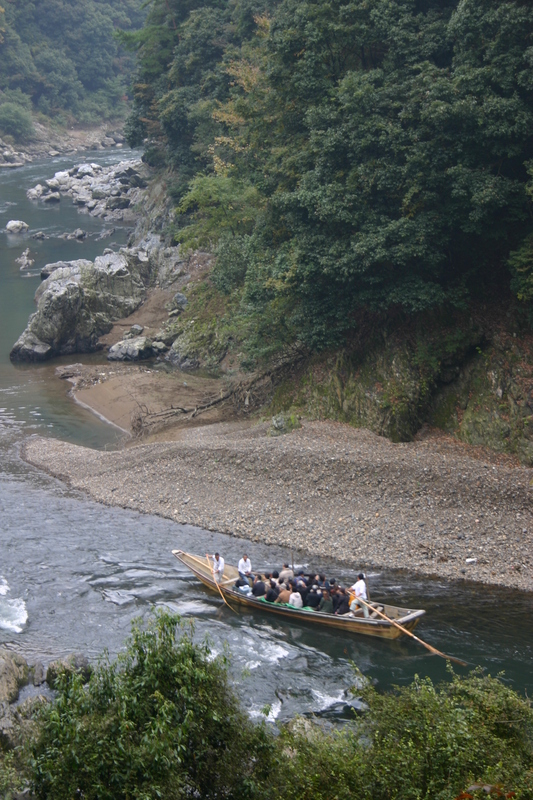 The route follows a paved forest road for the first half hour or so, with splendid views down to the emerald green waters of Hozu river. Occasionally a traditional wooden sightseeing boat would glide past, packed with crowds hoping to catch the autumn foliage in the early morning cloud. After pushing through a few dark tunnels, I finally crossed the distinctive orange bridge which marked the start of the path. This junction couldn’t have come sooner enough, as some of the idiots driving on that treacherous road obviously failed the ‘slow down for pedestrians’ part of their driving test. Dropping down to the riverbank, I couldn’t help noticing the vast amounts of garbage strewn about. Relics of a summer’s worth of barbeques and clueless daytrippers with no regards for the environment. There was clearly too much to pick up without garbage bags. If I lived in Kyoto I’d definitely try to organize some kind of clean-up effort. What do the locals think of all of this? 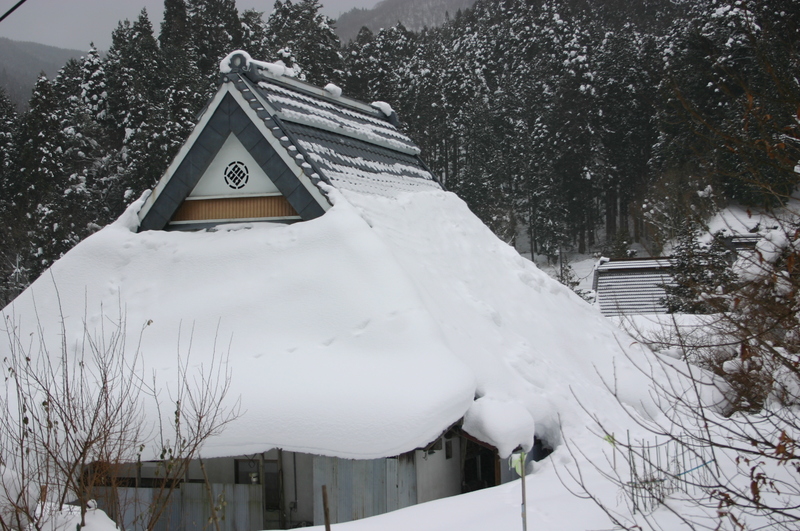 Even the village of Kiyotaki looked much worse for wear, with an abandoned ryokan slowing being swallowed by the surrounding hillside. After a quick snack, I strolled on the main road through town and reached the turnoff for Mt. Takao. In all of my other excursions, I’d always forgone this section in favor of Mt. Atago, but today felt like a perfect day to stay low and explore some new territory. Plus, the sun had just decided to come out to greet me. 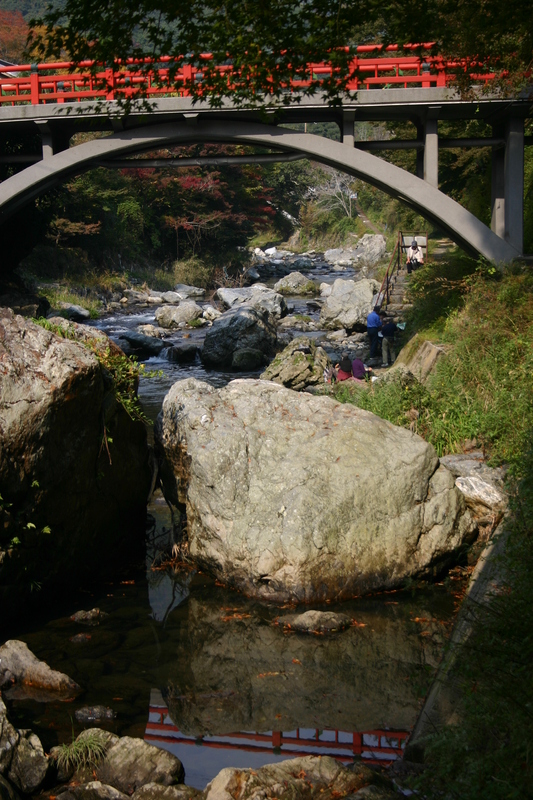 This section of Kiyotaki river was in stark contrast to the filth of before. Crystal clear water and absolutely no sign of trash anywhere. Oh, and not a soul around either. The river snaked deeper and deeper into the valley, punctuated in sections by rows of cedar plantations. At one bend of the river, I caught my first glimpse of the mountainside temple complex of Jingo-ji, my first target temple of the day. Another bend later, and I quickly lost sight of the place, and continued along at my gingerly pace. All of a sudden, I heard a crashing sound in the woods on the other side of the river. I paused, ears perked. Another crashing sound. I walked another 5 meters to the east, keeping my eyes peeled for monkeys frolicking in the trees. That must be the logical source of the noise, I thought. Immediately behind me, on a steep bank just off the trail, came another crashing sound, but no animal in sight. 30 seconds later, directly on the path about 10 meters in front of me, came another sound, this time of broken ceramics. Alas, the riddle solved, as worshipers were throwing small clay disks into the valley below. I was directly in the line of fire! Future hikers may want to bring a helmet just in case. In safety prone Japan, I was shocked to find no signs warning of hikers to “Beware of plates falling from the sky”. Perhaps I’ll make my own sign next time. Once out of the danger zone, I reached a paved road and the entrance to the temple that almost took my life. Plenty of stone steps to climb, but no problem for a seasoned hiker. Ladies in high heels, however, were another story. 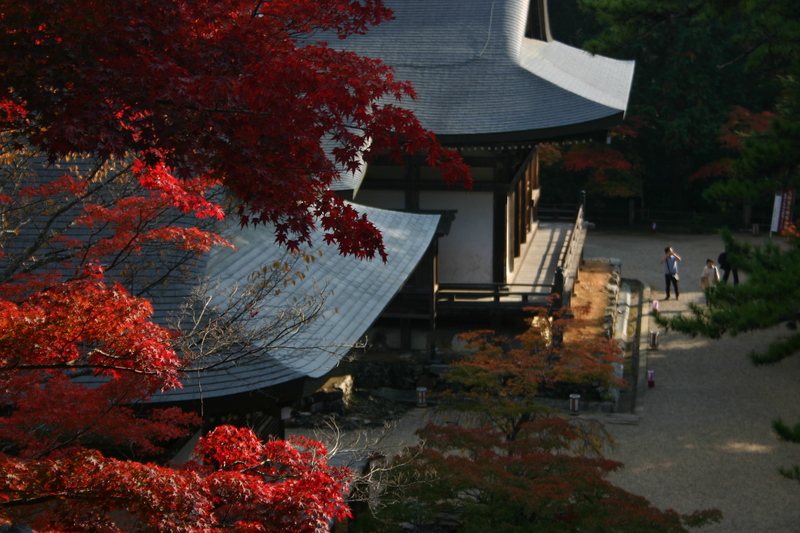 The temple itself was breathtakingly serene, with hardly a soul in sight despite the autumn foliage. After looking around for a while, I retreated to one of the outdoor dining establishments lining the path, wolfing down noodles while checking the map times. I still had 2 more temples to explore before taking a bus back to the city, but plenty of extra time before the next bus. Next stop: Saimyo-ji. Despite being an easy 15-minute stroll up the river on the paved road, I had the World Heritage temple completely to myself, a first in Japan. 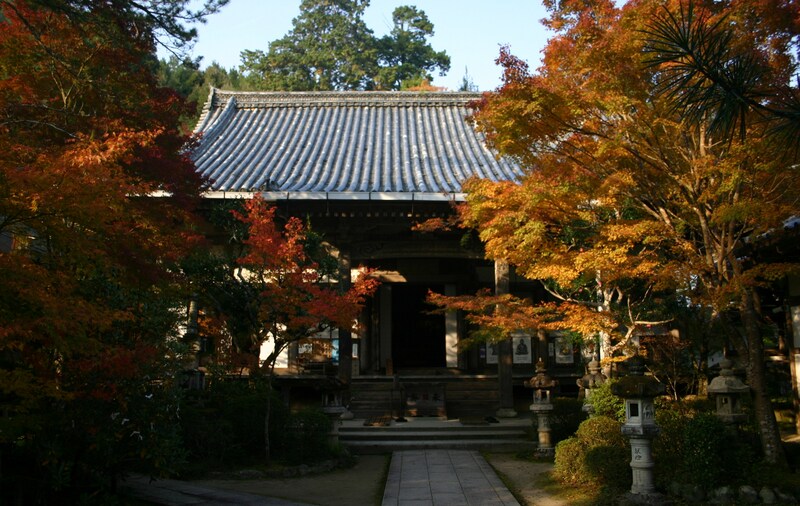 I sat in the main temple building, admiring the small but mesmerizing garden for around 20 minutes, listening to the sounds of silence. When in doubt, it’s always better to head to the smaller, lesser known places when given the chance. Once back at the road, I continued upstream about another 30 minutes before reaching the turnoff for Kozan-ji, a vast temple complex completely hidden in a dark forest. Absolutely eerie in the late afternoon shade, but a worthwhile detour nonetheless. Finally, 5 hours after setting off from Hozukyo, I boarded a nearly empty bus for the dreadful ride back to civilization. A free weekend in late November and I find myself once again in the urban chaos of Tokyo. Every time I come here I vow never to return, yet somehow always end up rubbing elbows with the masses on the Yamanote line. My plan this time around is to climb a mountain, ANY mountain! I turn to my trusty companion Yuuki who I haven’t seen since that fateful day over 2 years ago when I finally knocked off the Hyakumeizan. We quickly narrow our choices down to 4 peaks: the scenic lake and conical perfection of Haruna-fuji, the impossibly twisted rock formations of Mt. 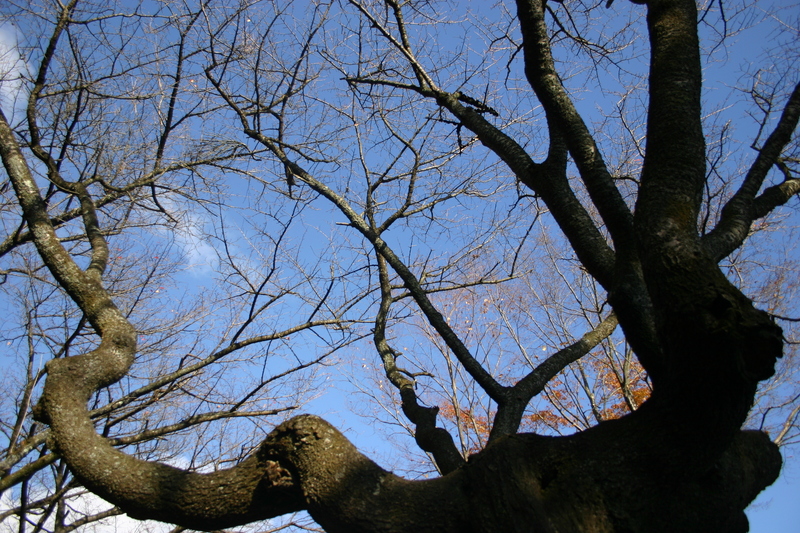 Myogi, a grand hike to Oodake at the foot of Okutama, or the overdeveloped mess of Mt. Takao. All 4 of these prestigious areas I had never had the opportunity to explore, but after a review of the logistics, we opted for the one with the easiest access. We set off from Ebisu station at the crack of dawn, and the train was already packed with day-trippers heading to the hills. At Otsuki station the masses disembarked on their way to Lake Kawaguchi and Mitsutoge, while a healthy portion of budding outdoor types held on for the final push towards Takaosan station. Chung-chung: the doors of the mighty metal box swung open and disgorged hundreds upon hundreds of tourists, all headed for our intended destination! I’d been warned about the crowds beforehand but truly couldn’t believe my eyes. Yuuki and I jostled our way though the ticket gates, grabbed a free map, and escaped to the nearby toilets. Nourishment was at the top of our list, but unfortunately the nearby soba shop was still closed, so we grabbed some rice balls from a street vendor and marched in unison with the other zombies towards the cable car entrance. 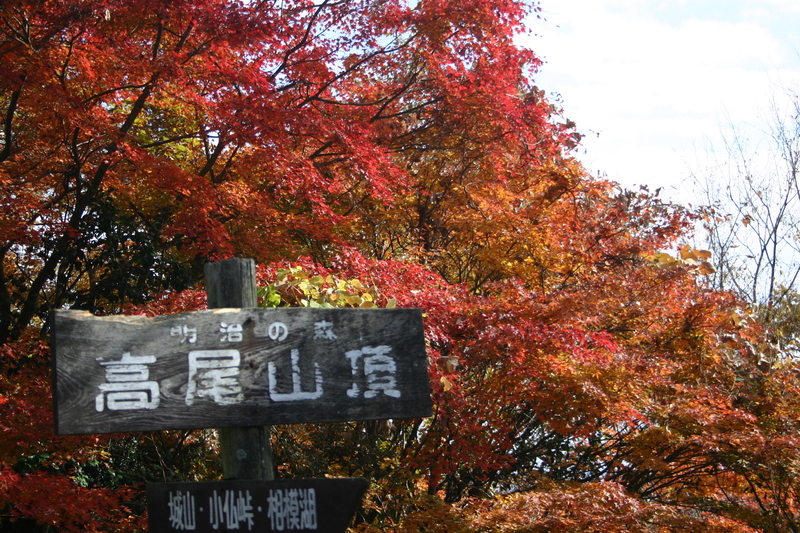 “We should be alone on this path” I quipped, pointing to the red Inari Yama Course (稲荷山コース), a sturdy, 3.1km ridge walk meandering through pristine forest. Our summation was that 90% of the daytrippers would choose the paved course under the gondola. 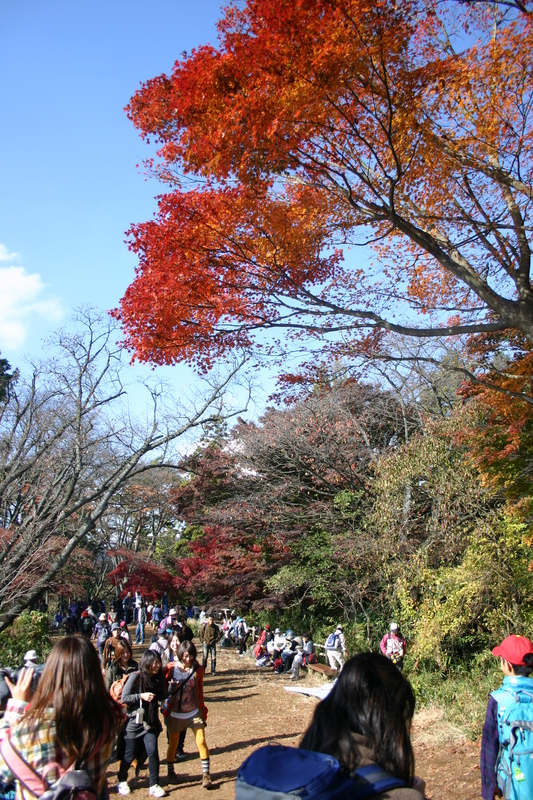 We were partially right in that only about 15% of the visitors chose the long route, but on this hectic autumn Sunday we’d forgotten to factor in the crowds. What’s 15% of 20,000 again? You get the picture. Despite climbing nearly 200 peaks in Japan, this was the first time I’d actually come face to face with a bona fide tozan traffic jam. Although we didn’t keep official count, I’d venture to say we overtook close to 400 people on the easy climb to the summit. I know that sounds a bit far-fetched, but if we passed one person every 7 meters (which I’m absolutely sure we did since we were overtaking people the entire way) then it begins to sound a bit more believable, doesn’t it? The two explorers retreated in disgust, but not before purchasing a bag of mikan oranges from a neighboring food stall. Hoping to avoid the crowds, we traversed 30 minutes further north to the summit of Mt. 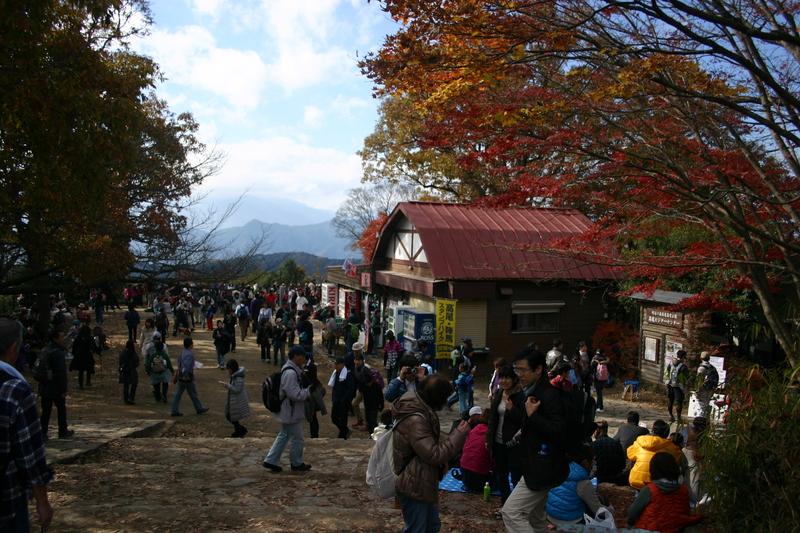 Shiroyama (城山), where sizable crowds and an extensive network of restaurants greeted us. We settled down at a wobbly picnic bench and devoured our oranges while watching the fashion victims. Would this madness ever end? The next target peak of the day was Mt. Kagenobu (景信山), where we discovered an even larger collection of restaurants and the same relentless crowds. Desperate times called for desperate measures, as Yuuki bought another beer and we splurged on hot noodles and oden. There were so many people that the restaurant was calling out orders by the customers’ last name. The shop clerk nearly fell off his chair when I told him to just call me gaijin. Sure enough, heads truly turned when the cook shouted out gaijin san, ooda dekimashita (hey foreigner, your order is ready!) I carry my Osaka sense of humor with me wherever I go. Halfway into our luxurious feast, the faint sound of a helicopter wafted through the air. Scanning the horizon, we spotted what looked to be a news helicopter approaching to film the crowds. “It’s heading for us”, I exclaimed! As the copter noise grew louder I became intrigued with the sheer size and unfamiliar red tint on the porpoise-shaped nose. 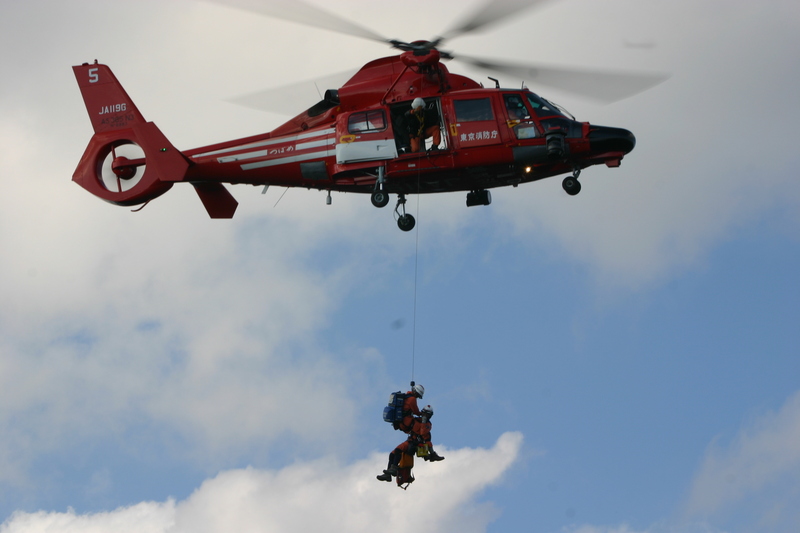 “Hey, that looks like a rescue copter”, Yuuki shouted, spotting the Chinese characters for the Tokyo Metropolitan Fire Department on the belly of the aircraft. The copter circled the peak once before hovering above the summit directly behind the restaurant. Off we went to investigate. Two rescuers quickly abseiled to a grass clearing and hurriedly scampered to a nearby picnic bench. An unidentified figure laid motionless, the victim of either over-consumption of alcohol or acute heart failure. I’m not a huge fan of gawking and peacefully retreated back to my waiting meal. Several more firefighters descended from the copter for back-up assistance, as another half a dozen climbed from the parking lot at Kobotoke (小仏) Again, this was another first for me in Japan, though I must admit that it’s not something anyone should have to witness up close. Earlier in my mountaineering career I saw a recovery operation at Long’s Peak in Rocky Mountain National Park, but it was from a safe 20km distance. Seeing a copter hovering 20 meters away is an entirely different story. Yuuki and I took the rescue as a sign that we should abandon our attempt to climb Mt. 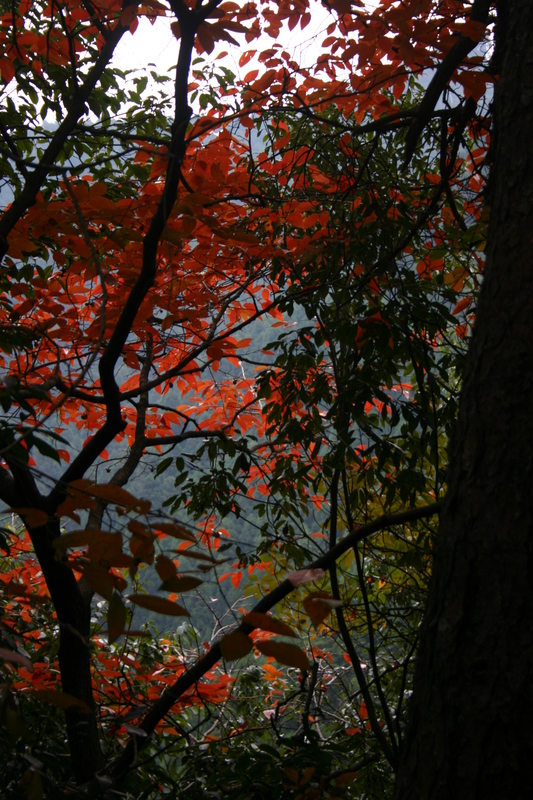 Jinba (陣馬山) and take the easy escape route to the south. Along the way, we passed the rescuers we’d seen on the summit and thought about asking what happened, but again, it’s not something that I really need to know about. Someone couldn’t make it off the mountain under their own power and were successfully airlifted to safety. Does the cause for that assistance really matter? Safely arriving at the paved forest road, we turned left and raced towards the bus stop. Upon arriving, we realized that we had 45 minutes to wait until the next bus and would be the 50th person in line to make that bus. 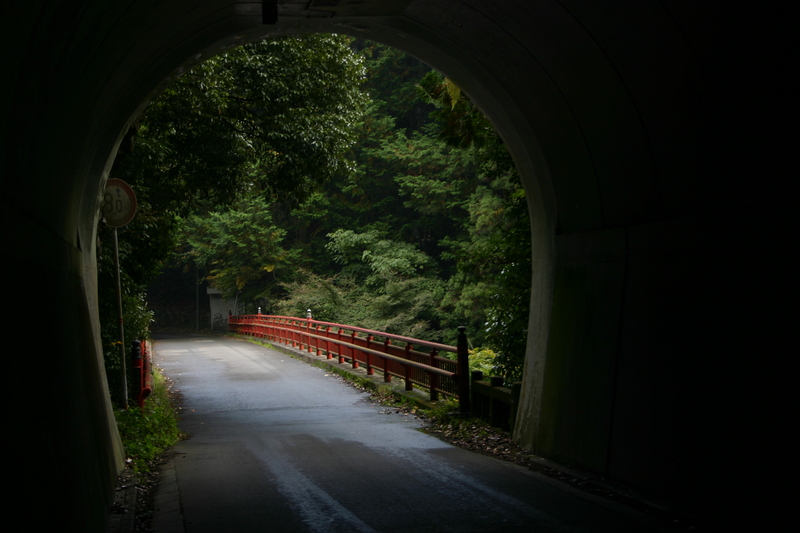 When I mentioned to my companion that it’d be a lot faster and more interesting to hitch a ride back to Takao station, his eyes lit up like an 8-year old on Christmas morning. “Yes, just like old times”. You see, Yuuki and I had our fair share of flagging down rides on Mt. 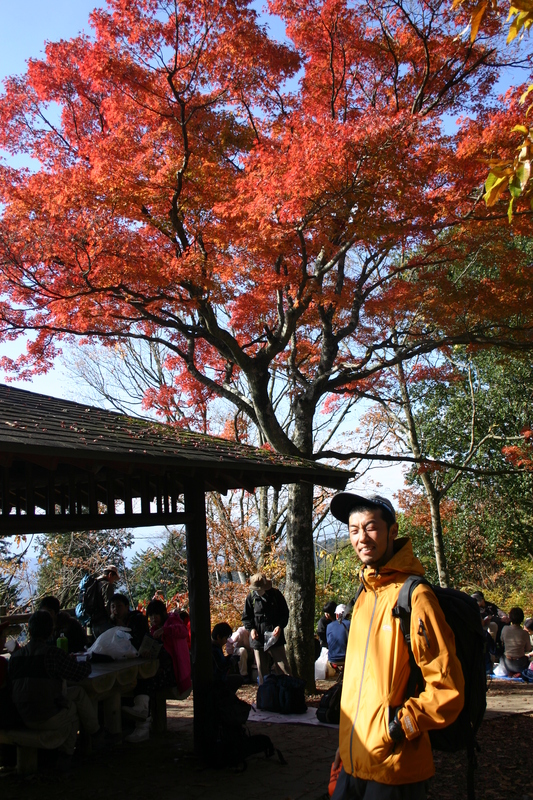 Zao and Mt. Nantai and were eager to brush up on our skills. Yuuki has developed an uncanny technique for hitching rides. Left arm fully extended, thumb outstretched, he reaches up with his right hand for the bill of his blue Kavu hiking hat, lowering the cap as if to ask for a donation while slightly bowing his upper torso. A quick twinkle of the eye to the driver and whammo: a free ride to our chosen destination. We walked down the asphalt road towards town and thumbed down whatever came toward us. First a motorcyclist gave a quick nod, followed by the firetrucks, who chuckled from the comfort of their cabs. The first driver that stopped had a car-full of kids and absolutely no room for us, but just wanted to stop and politely tell us he couldn’t take us. The next car pulled over and we slyly crawled in, much to the disbelief of the other Japanese hikers who’d opted for the 10km hike back into town. Back at the station, we boarded a Tokyo-bound train, vowing to never visit this place again. Don’t get me wrong. I’m sure Takao has its merits, but the heyday of strolling through an untamed piece of nature so close to the capital is truly gone forever.